OK, that is a pretty good explanation for this new way to create and manage content. It’s aimed at producing information across a variety of channels, allowing users to consume in the medium that suits them best. It defines how this “methodology” allows businesses to be more effective in producing and managing their content, as well as how they communicate with their customers. Everyone gets information in the way they want it, so everyone wins! So… just go build a system to do that and everything will be great! Omnichannel is better defined as planning content delivery for multiple devices and systems. It’s about interoperability. Because every channel is different, they require specific platforms and processes to work properly. Content destined for the web is MUCH different than what you’re going to send to Alexa. Understanding the various formats is key for developing an omnichannel solution. So, how does a developer do that? To show you how to plan for Omnichannel, you have to start with some content. Let’s take the example of an online store. Businesses are constantly getting new products to sell, all of which need to be promoted to the masses so they can be picked up and given away on the next Oprah’s Favorite Things episode. Once a new product is ready for sale, the Marketing team will want to make sure people know it. This means they’ll create a landing page, email campaigns, tweets, and a host of other communications to reach as many customers as possible. All these communications are going to need to be stored somewhere, and delivered to various destinations in the correct format. For developers, this is where you start thinking of where you’re storing the content, and how you’re going to retrieve and display it. Kentico Cloud takes care of a lot of this for you, by giving you a central, cloud-based solution for storage. The technology-agnostic API is perfect for retrieving. This means you only need to worry about your content structure and how you’re displaying it. Let’s break them down into a few common channels. In this article, I’m going to show various techniques for displaying content. If you follow my blogs, you will recognize these topics from previous posts. The idea behind this post is to show how to combine those ideas into a single, omnichannel solution. For storing web content, you can choose plain text or rich text, depending on your needs. Because web browsers can handle all sorts of content types, rich text with decorations and formatting can be used. 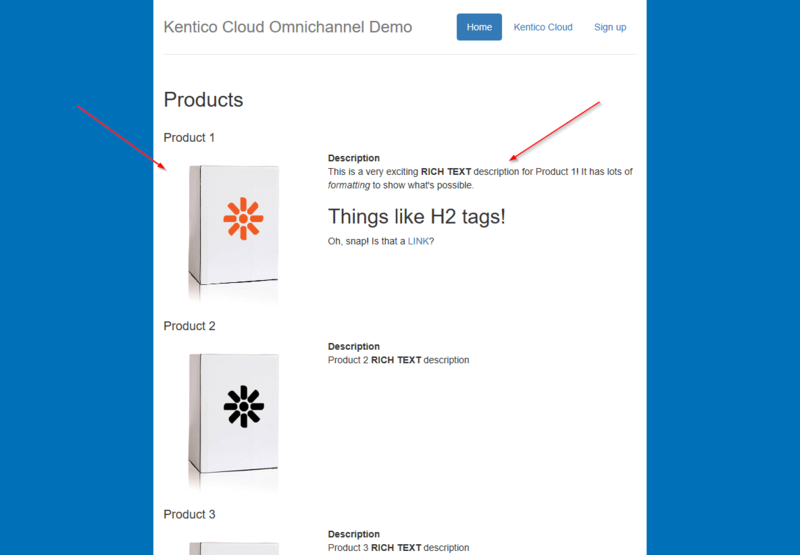 In Kentico Cloud, you can use a Rich Text element to store all your product info in the formatted text. Kentico Cloud has the IRichTextContent interface, which parses the content into “blocks”. You can use these blocks to display your HTML content and retain all the formatting. 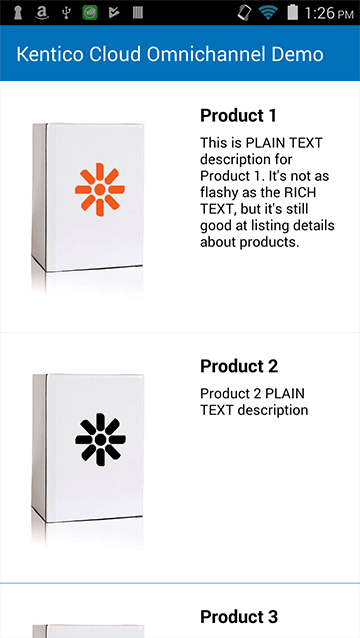 In my Product Display Template, I write the raw content, joining the blocks as I go. The result is my rich text using the correlating HTML tags. You can find out more about creating ASP.NET Core MVC sites with Kentico Cloud in my blog here. If you’re running a site, chances are good that you have a mobile app to go along with it. One of the biggest challenges is displaying web content on mobile devices. Because HTML is really a web technology, content needs to be in a more basic format to display properly on the device. 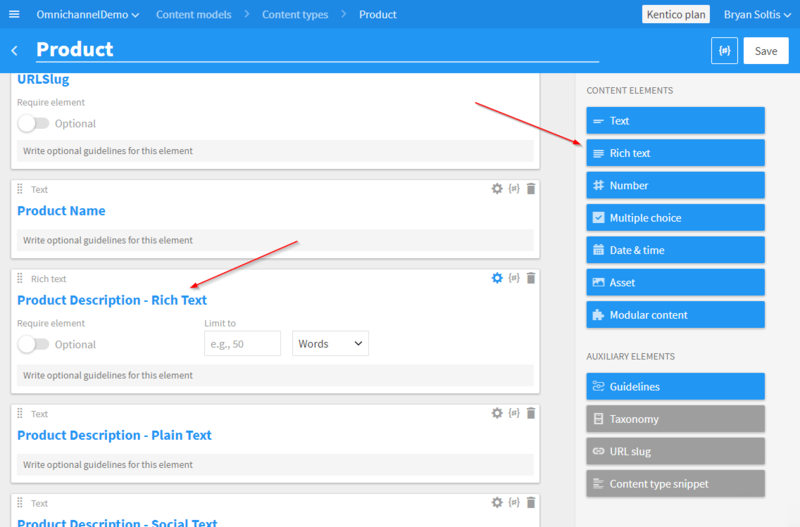 In Kentico Cloud, you can use the Text element to display your “simple” mobile content. This content will be more basic and only display the text without formatting. 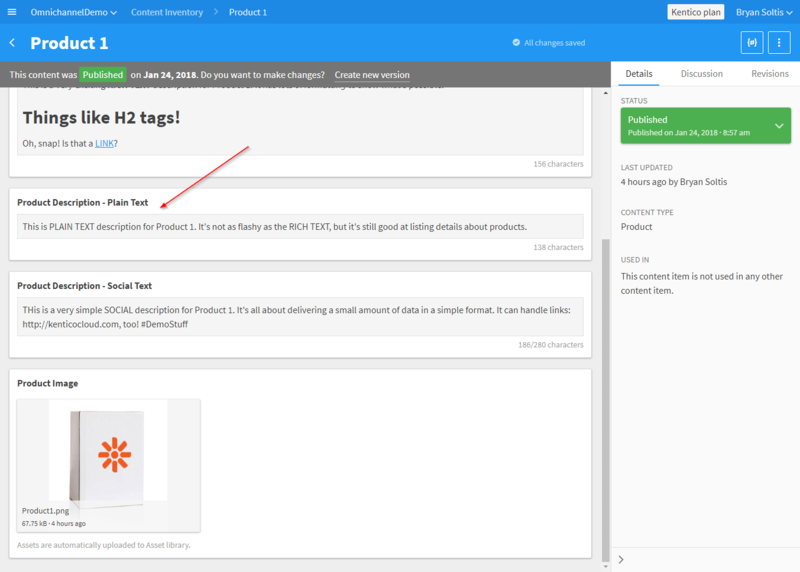 For displaying the content, you can use a generic label and text box controls to show on the device. In my demo, I’m using the following code to display the content in a Xamarin application. 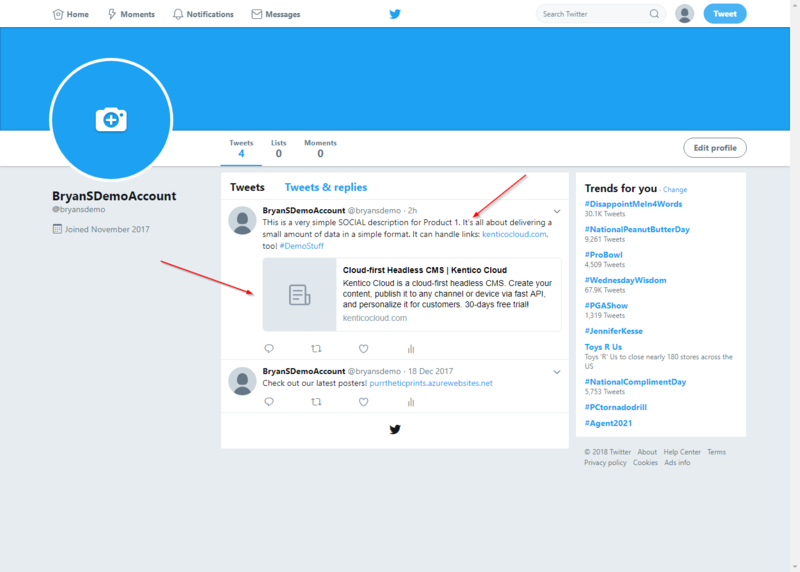 Here’s how the content looks within the application. You can find out more about building Xamarin apps with Kentico Cloud in my blog here. When it comes to social media, all content rules get thrown out the window. With character limits, proprietary formats, and social faux pas, developers really need to think about how the content gets posted to Twitter, Instagram, and other channels. This means storing content in specific elements and ensuring only valid data is entered. For Twitter, it’s all about character limits. In Kentico Cloud, you can leverage the Character Limit properties on a Text element to ensure your editors enter valid content. There a million ways to post to Twitter. 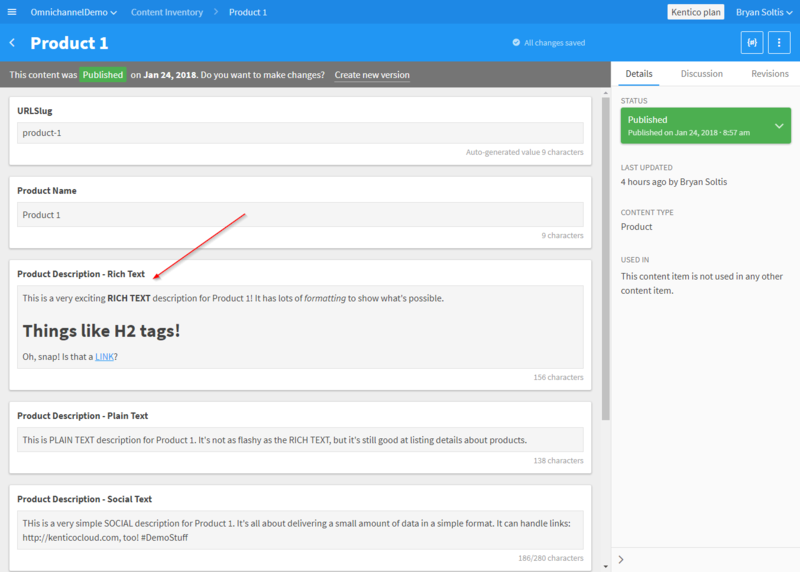 In my demo, I opted for the Azure Logic App + webhook approach. First, I created my Azure Function to retrieve the social description. 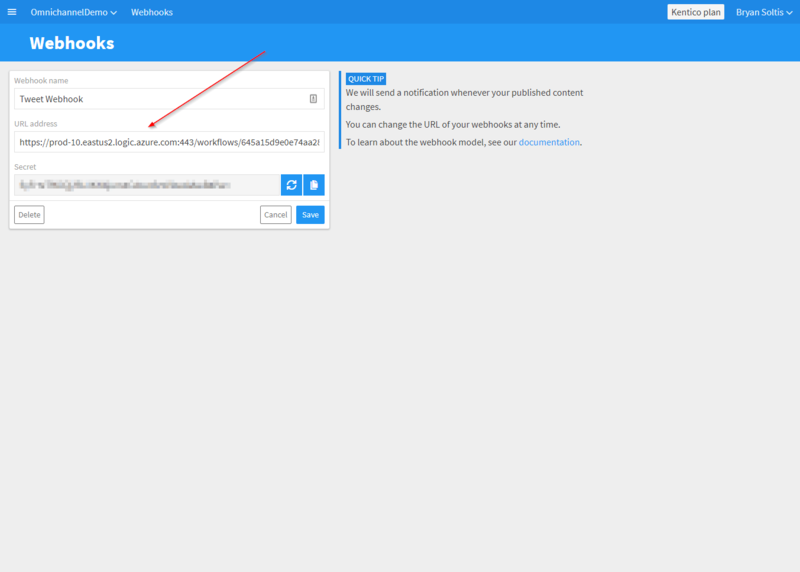 Next, I created an Azure Logic App to handle the webhook notification. The App validates the action, then calls my Azure Function to retrieve the social description. With that, the App uses a built-in action to post directly to Twitter. Lastly, I created a new webhook in my Kentico Cloud project, pointing to my Logic App. When the content is updated in Kentico Cloud, it notifies the Logic App, which kicks off the posting action. 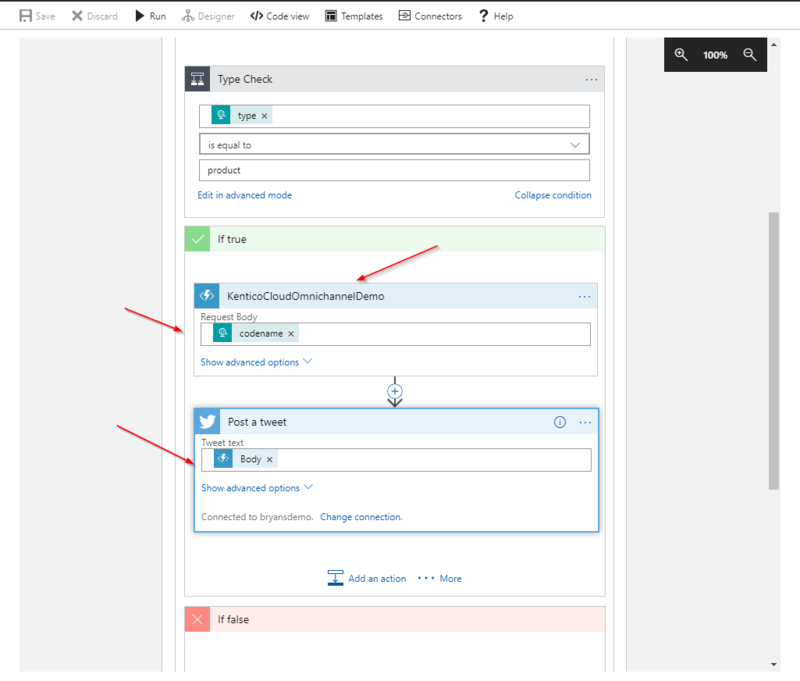 You can find more about using Azure Logic Apps with Kentico Cloud in my blog here. Planning for every place content will be displayed is a tough job. Luckily, when it comes to omnichannel, Kentico Cloud has your covered! 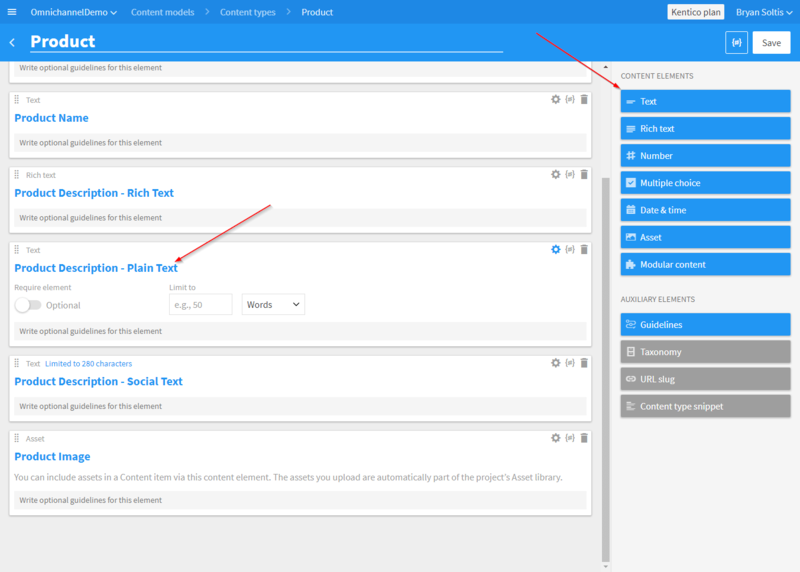 With multiple ways to store and deliver information, you can easily configure your projects for any medium. By leveraging character limits and required fields, you can ensure the data your editors enter will be displayed properly. I hope this article showed you how to combine multiple development techniques into a complete omnichannel solution. Good luck!